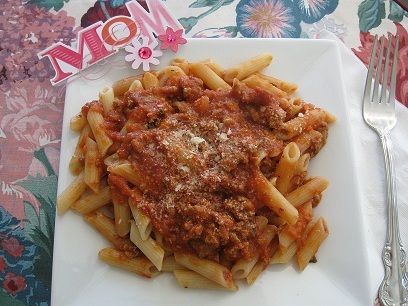 A gluten-free mother's day recipe from NFCA Volunteer Annette Marie of Best Life Gluten-Free. Would you like to surprise Mom with dinner on Mother’s Day or on any day, for that matter? Why not an Italian dinner that you can easily make from scratch? Bolognese sauce is pretty easy and this recipe shortens the time to 1 hour. There are various recipes out there, some simmering the sauce for 2+ hours, but you can achieve similar results with this one, which shortens that by half. 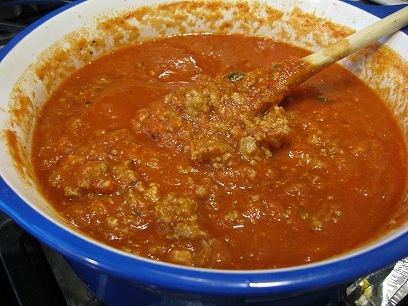 Bolognese sauce also varies in which meat you choose to use. Some recipes call for ½ ground beef and ½ ground veal. I’ll leave that up to you. Here I used just ground beef, so feel free to follow this exactly or combine the two. Just use half as much of each, if you combine them. I also don’t use “naked” ground meat. I prepare the ground meat as I would for meatballs. Then instead of rolling into a ball, you just leave it un-shaped and brown it in your saucepan, so its result is a loose meat within the sauce. Please let me know if you prepare this and how you like it! Bon appetito! This dish will taste like you slaved in the kitchen for hours, but no one has to know this recipe cuts your cooking time in half! Grated Italian cheese to garnish when ready to serve. Take a frying pan and brown the meat in the hot vegetable oil, loosely stirring as you brown it, and turning over to brown all parts. Drain off any fat and oil and then set aside until it’s time to add to the saucepan. In a large saucepot, place the olive oil and when hot, sauté the onion and garlic. Don’t allow to brown. After onion is translucent, add the shredded carrot and celery and sauté for about 4 – 5 minutes. Now, add the browned meat, and stir into the vegetables. Your Bolognese sauce should start to look something like this! Cover and begin to cook on a low-medium heat. Keep checking. When it’s simmering, reduce to low and simmer for 45 minutes. Be sure to stir frequently and touch the bottom of the pot when you stir! This isn’t something you can set and forget. It will stick to the bottom and burn if left unattended for more than 10 minutes. So, if you feel you may forget to stir, set a timer for every ten minutes so your results will be the best! When it’s done, you can remove from heat and leave covered until your gluten-free pasta of choice is cooked. Boil the pasta until “al dente”. Drain pasta and place it in a large bowl so you can pour this yummy sauce on top and fold into the pasta to coat well. Add grated Italian cheese on top and enjoy! !